After marathon sessions stretched into an extra day at the United Nations Framework Convention on Climate Change in Bali, the 190 nations in attendance were able to hammer out a “road map” agreement on Saturday for continuing formal negotiations toward a final pact to replace the Kyoto Protocol that expires in 2012. Reports are that the United States team was finally “booed into submission” from the rest of the world, as represented by the assembled delegations. The first sticking point was the EU’s proposed text calling for a 25–40% cut in greenhouse gas emissions by 2020, which was rejected by the United States, Japan, and Canada. Negotiators agreed to drop specific targets from the initial framework in favor of a more general acknowledgment that “deep cuts in global emissions” will be required and the need for “urgency” in addressing climate change. The final roadblock toward a final agreement came when the United States resisted a proposal by the main developing-nation bloc, the G77, for rich nations to do more to help the developing world fight rising greenhouse emissions. That didn’t go over very well at all. Bill Hare of Greenpeace said "The US has been humbled by the overwhelming message by developing countries that they are ready to be engaged with the problem, and it’s been humiliated by the world community… I’ve never seen such a flip-flop in an environmental treaty context ever." After the United States finally relented, the agreement was reached to continue the formal two-year negotiation process to be completed by 2009, in time for a pact to be in place by 2012. Not as widely reported as the commotion over the U.S. delegation is an important shift from the Chinese, agreeing for the first time to language that may commit developing countries to emission reducing policies that are “measurable, reportable, and verifiable”. Something for which the lack of has been an ongoing concern from the United States. Not everyone is thrilled with the agreement reached in Bali. Angus Friday, Grenada’s Ambassador to the UN and chair of the Alliance of Small Island states clearly stated his disappointment: "We are ending up with something so watered down there was no need for 12,000 people to gather here in Bali to have a watered-down text. We could have done that by email." Nonetheless, U.N. 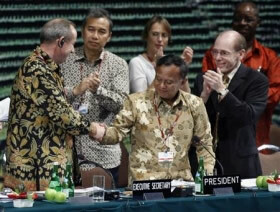 Climate Change Secretariat head Yvo de Boer said of the Bali talks, "All three things I wanted have come out of these talks — launch, agenda, end date”. So now, after a tough and sometimes emotional two weeks of negotiations, a “road map” has finally been hammered for talks to continue over the next two years that will hopefully lead to a pact with sufficient means to effectively address global climate change.